DB2 9 for z/OS is an exciting new version, with many improvements in performance and little regression. DB2 V9 improves availability and security, as well as adds greatly to SQL and XML functions. Optimization improvements include more SQL functions to optimize, improved statistics for the optimizer, better optimization techniques, and a new approach to providing information for tuning. V8 SQL procedures were not eligible to run on the IBM System z9 Integrated Information Processor (zIIP), but changing to use the native SQL procedures on DB2 V9 makes the work eligible for zIIP processing. The performance of varying length data can improve substantially if there are large numbers of varying length columns. Several improvements in disk access can reduce the time for sequential disk access and improve data rates. The key DB2 9 for z/OS performance improvements include reduced CPU time in many utilities, deep synergy with IBM System z hardware and z/OS software, improved performance and scalability for inserts and LOBs, improved SQL optimization, zIIP processing for remote native SQL procedures, index compression, reduced CPU time for data with varying lengths, and better sequential access. Virtual storage use below the 2 GB bar is also improved. 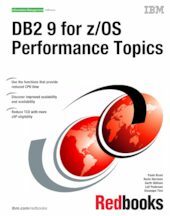 This IBM Redbooks publication provides an overview of the performance impact of DB2 9 for z/OS, especially performance scalability for transactions, CPU, and elapsed time for queries and utilities. We discuss the overall performance and possible impacts when moving from version to version. We include performance measurements that were made in the laboratory and provide some estimates. Keep in mind that your results are likely to vary, as the conditions and work will differ. In this book, we assume that you are familiar with DB2 V9. See DB2 9 for z/OS Technical Overview, SG24-7330, for an introduction to the new functions.